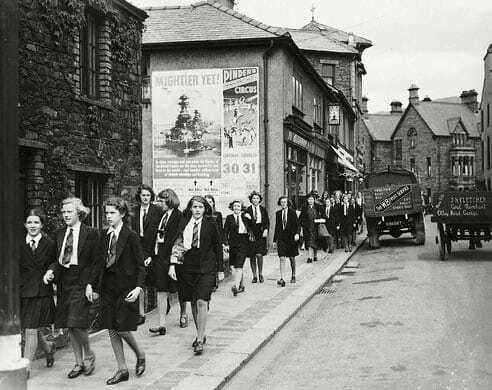 Here's a recent post by Jo on Facebook where she remembers the days when she would go to school on foot. I thought I'd post it here! Idly reminiscing, as one does when one is alone, I was looking back on the winters of my childhood. It was frequently very cold; we often had snow. But even in 1947 School was always open. We walked there wrapped up in warm winter coats and if it was snowy, we wore wellington boots with thick socks. We were allowed out in the playground at break time, and if our gloves were wet, as they often were with playing in the snow, they were dried out on the radiators before we went home for dinner at midday - walking again! When it was very cold, the free milk in third of a pint bottles froze and had to be thawed out in our tin mugs before we could drink it. But it was still delivered! Mind you, this was in London. Maybe rural areas were more affected and children were not able to get through snow. However, I can’t help thinking we were a hardier bunch of people then. We didn’t have cars to get stuck in the snow. We walked everywhere. In 1963, my neighbour and I took our babies to the clinic, 2 in one pram (large sprung variety) and pushed it down the middle of the road, which had been gritted and cleared. That year, council workers came with trucks, shovelled up the snow and dumped it in the local park so we could get out. I don’t remember having problems with food, except that there were still shortages after the war had ended, but we didn’t starve. Maybe we need to go back to some of the old self-sufficiency and resourcefulness we had then rather than craving the exotic food we have become used to? And walk to school!